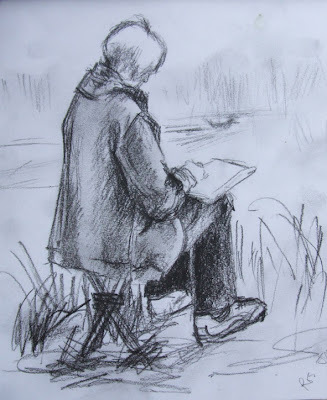 On Monday I went sketching along the canal at Aylestone with Ros - sketch of her above, working hard. .... and of course I didn't have my camera. It was a lovely warm, still afternoon and everything was lush and green. Along the bank in front of us the seed heads on the grasses were a pinky mauve colour and there were white clover flowers. 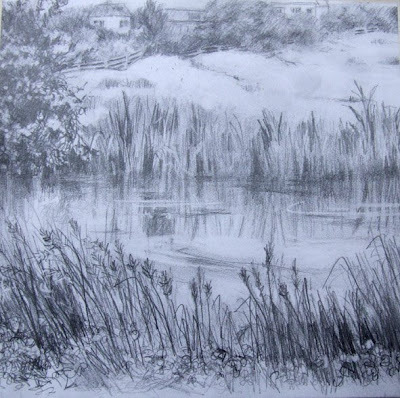 This was the first sketch I did using a mechanical pencil - it's ok for the light and the information I need is there - but it's a bit grey for me and I don't find it as interesting as using colour. I was quite pleased with the shine on the water and the reflections and ripples. I'd ordered some inktense pencils - and as I can't find my Neocolor II's I gave in and bought some more. They arrived and I had the little play above, working from the pencil sketch. I like colour! I'm enjoying using them. 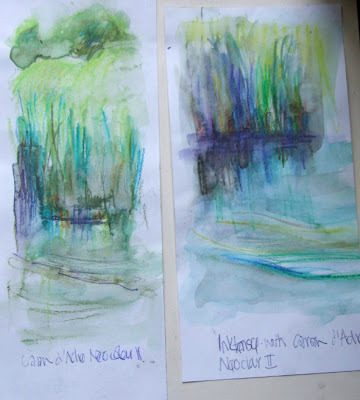 The inktense aren't as waterproof when dry as they seem to claim - they do still lift and muddy other colours. This was done from the pencil sketch, changing elements a little and finding out what the inktense and Neocolour II will do when used together. I like the fact that you can get very subtle colours out of them as well as deep vivid tones. Some of my students liked the pencil sketch better and others the coloured version - what do you think? I like the coloured one best. Vivien, interesting question...seems to me that both mediums invoke different moods and both are nicely done. My totally subjective opinion is that the pencil sketch invokes the medieval mood or feel better, so I like that one. an interesting point Rose - the Victorian canal cut through the original fields and there is a small stream as well as a river and canal so the area is a flood plain. There is an ancient packhorse bridge there as well. One of my favorite subjects!...waterways. You certainly have a way with reflections in any media. I love the pencil sketch!Especially the watery feel of it. The coloured one is fine, too, as a trial sketch, but I missed the ripples! Maybe you were not "doing" water movement in this? For what it's worth (not much!) I sometimes use Aquarelles, dry and as water colour and like their softness.And they seem to retain colour as I know of some that have been around for more than 20 years in frames on walls. Yes the second one was simply to see how the media worked and I didn't go so much for the ripples - being a canal there isn't much flow but passing moorhens and breezes did keep creating patterns of movement. it is from memory and of newlyn Lighthouse, so there is a Cornish connect. I like those little ones best - guess why! 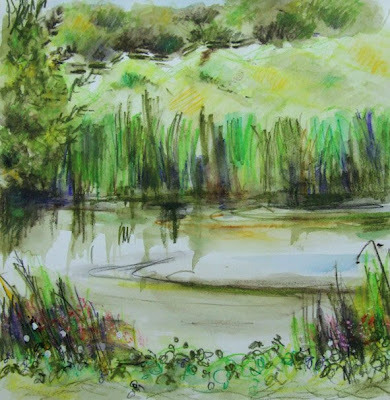 I absolutely love the quick inktense sketches--the colors, the movement, the energetic feel of them; and marsh grasses are a favorite subject too! Tough choice between the pencil and color sketches--there's a different feel to each, but I especially like in the color one that the water is left mostly colorless! Chris I'm off to have a look at your Cornish sketches :>) - I'm hoping to go down to Sennen Cove in September - an area that I've never stayed in and don't know as well. so I'm quite excited about it :>) - near to the Great Atlantic Mapworks Gallery and St Ives and Penzance for the galleries too! Both look good Vivien, but my preference is for the pencil sketch. Very nice! I like both of these - but am instinctively drawn to color, and you've handled it beautifully here! I also recently cracked for a set of inktense and what you've done here is really inspiring me to get to work! I look forward to seeing what you do with the Inktense Casey - you use watercolour so well. I only bought a set of 5 to try them out.